Activist performance can be understood within a wide range of different historical frameworks. [E]xamples [that] have been particularly influential [include] … George McKay, Senseless Acts of Beauty. Jenny Hughes and Simon Parry, Contemporary Theatre Review 25(3) (July 2015). 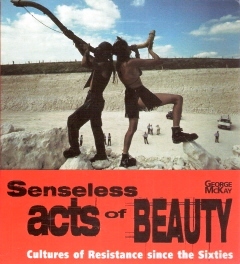 With a shock I realised this morning that next year will be the 18th anniversary of the publication of George McKay’s Senseless Acts of Beauty, an account of counter-cultural protest and DIY politics published by Verso. When I was a young rep in academic publishing, I loved this book. Along with Sarah Thornton’s Club Cultures from Polity Press (I still have the T-shirt – thank you, Polity), McKay’s work was one of the earliest serious books about the counter-cultural movements of the 1990s. I was working in Scandinavia in the run-up to publication, trundling around in the snow with a bag full of new book information for academics. To a certain amount of surprise, including my own, we found we had a hit on our hands. Senseless Acts of Beauty became adopted as a textbook in a number of universities and was much discussed in the press. The world of both McKay’s and Thornton’s books can be witnessed in the vibrant protest culture of my home city of Brighton – even our MP, Caroline Lucas, got detained by the police this week at the Balcombe anti-fracking demonstration. Since the mid-90s though, much activism has migrated online, so I wonder if it is still true that ‘ if there is resistance anywhere in Britain today, then it is here, in the beat-up buses, beleaguered squats and tree-top barricades’. Maybe I am too long in the tooth now to be able to comment on whether Thornton’s analysis of the ‘hierarchies of hipness’ is still valid – but it does seem that people continue to get up and do something to show they care, and dance while they do it, as in the One Billion Rising demonstrations. I wonder what McKay would have to say about the flash mob? EJ Drew, The Old Reading Room (20 August 2013). George McKay made a significant contribution to the ‘consciousness’ of the protest movement with his seminal study of the radical protest since the 60s, Senseless Acts of Beauty. Jeremy Gilbert, ‘Reflections on Britain’s student movement’ (2 March 2012). As obnoxious and anti-social, Crass came to be considered an icon radical-chic, launched a style, a patented design with great success, taken from hundreds of bands (and not only). They fielded amazing ideas as their "expiration date" when they formed they decided that they would split up in 1984. And so they did. Musically, alternated marches a little punk 'wrecked in moments of brilliant experiments apocalyptic. They were, in addition to Discharge, the theoretical maximum of punk-rock paranoid. They moved in different artistic fields and communicative, with unity of purpose, originality and autonomy. They were one of the few groups to truly embody the meaning of DIY and self-management of the music. Finally, we have represented a valuable source of inspiration, on all fronts. The reason is clear from the text downloadable below: This is the chapter that George McKay dedicated to the English group in the essay "senseless acts of beauty" (1996, Italian edition: Shake 2000); still one of the best things written about [the band], a summary of reasoned thought about Crass. Review of Crass chapter from Atti Insensati di Bellezza. Pseee Pseee blog (4 May 2011). In my constant search for the hidden histories of the UK, I have come across all kinds of books, websites, records, places and people that fall outside of mainstream discourse; they make up a fascinating counter narrative that I’m having to piece together bit by bit. What I learnt at school didn’t help that much, and neither does the mainstream press. I came across George McKay’s excellent book Senseless Acts of Beauty in a rather round-about way; reading the liner notes ‘May Inspire Revolutionary Acts’ by The Mob (excellent eighties anarcho/traveller band, who were part of the squatted community in Brougham Road, Hackney) it mentioned the book in positive terms…. Dutifully/ obsessively I tracked the book down (finding out it was published by the ever excellent Verso Books) and was mightily impressed and enlightened. The book finishes with the passing of the Criminal Justice Act and the ramifications that had; the book was written in 1996 and obviously a lot has happened in the years between then and now, but this is an essential read for anyone interested in the history of the counter-culture in Britain, and an inspiration to anyone involved with the current protest movement—you realise you’re not alone, and never were, rather you’re part of a grand tradition that needs to be remembered and discussed. Gary Budden, New Lexicons (April 1 2011). By establishing connections to anti-colonial or civil rights struggles of the 1950s, it is possible to grasp exactly what is changing and when it changed. Exemplary here is George McKay’s study of British resistance and protest since the 1960s. His work makes particularly clear the importance of post-1960s festivals to ongoing radical protest. Apart from McKay there seems to be no single author or tradition that is dominant, simply an ongoing accumulation of studies. Tim Jordan and Adam Lent (eds.) ‘Introduction’, Storming the Millennium: The New Politics of Change (London: Lawrence and Wishart, 1998, 8). I did a couple of papers a few years ago on the connections between the different post-60s movements, and couldn’t at the time find any recent academic work which wasn’t keen to fragment things and isolate specific events, movements, subcultures etc. for analysis. A lot of German and American work did take it for granted that there were such connections, and to be fair some German researchers have looked at movement cultures *as cultures*, as has Melucci to some extent. But it’s precious little. There are a couple of books from the 60s and 70s which make the substantive point but in such a way that they’re unlikely to convince many people in the 90s…. So McKay’s book was wonderful, because here was someone finally talking about the same things I was researching, but from the opposite angle, of tracing the specific connections between movements and cultures in one time and place, rather than trying to theorise (as I am) an experience of running into related mental and social worlds in a whole range of countries and trying to come at that from a bottom-up ethnography on the one hand and a top-down theory on the other and hoping they met in the middle. Lawrence Cox, discussion board (30 June 1998). [T]he first thing to be said about George McKay’s book is that it is a good read…. [O]ne can’t wait to turn the page to see how the narrative unfolds, how the spirit of change manifests itself and how the protagonists respond. Like any telling of a historical tale, when it is done well one is encouraged to suspend what one already knows and imagine what might have happened. At the end of Senseless Acts of Beauty (a problem in itself as McKay confesses that there is no conclusion), it can be said that, irrespective of how such effective one thinks the action to be, there is at least the feeling that some political action is happening, that motivation for radical change is still in evidence…. This is not a theoretical book, in fact it refuses to privilege theoretical discourse, preferring instead to remain faithful to one of its key themes: accessibility…. [T]hs aside, the book is compelling, inspiration and timely. It should be read by as many people as possible, many of whom will ask themselves one question: what have I been doing all this time? Neal Curtis (1997), Body and Society, 3:3, 113-116.